This photograph offers a look into Issaquah’s past as home to several mills. 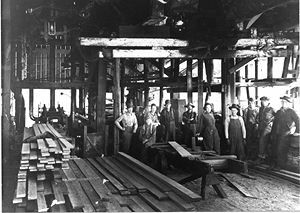 Part of the Issaquah Lumber Co. crew is shown in the planer shed at its Monohon Mill in this circa 1943 photo. The local faces include Floyd Erickson (third from left), who is standing next to his father, Eric Erickson (fourth from left). Members of the Rudstrom family also are in the picture, which illustrates how women stepped into such jobs during World War II (sixth and eighth from left). The Monohon Mill no longer exists, and the Issaquah Lumber Co. is now the Issaquah Cedar & Lumber Co. located on East Lake Sammamish Parkway.